Okay, we hope you're ready for the total awesomeness of this HOT new style!!! The mono top is SO perfectly made, and it's a double mono meaning you have an EXTRA layer of silky soft monofilament between your skin and the knots of the wig. This makes your wig look even MORE convincing than ever! 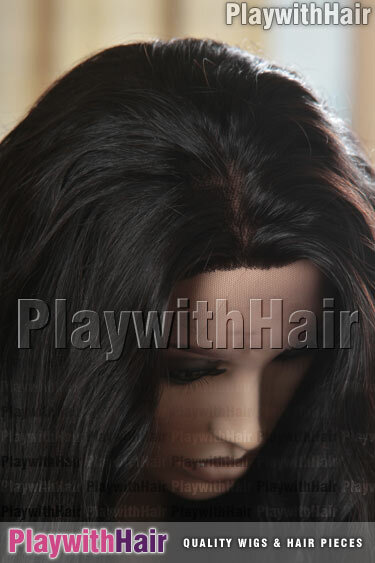 The hairline on this wig is all hand tied, making the hair look like it's growing out of your head - and the lace is Swiss Lace, a much softer and more comfortable wearing lace that looks more realistic against your skin. Best of all, this stunning style is made from 100% Remy Brazilian Human Hair - Brazilian Hair is SUPER soft, and really silky - It's amazing how great it feels! This gorgeous new wig also has a soft and easy to wear adjustable Average Size cap, for a snug all-day wear that feels as great as it looks!